You're Using Social Media. But Just Who Is Overseeing It All? NEW YORK (AdAge.com) -- Social media is undoubtedly shaking up the digital landscape, but it looks to be shaking up the corporate suite as well. As brands try to foster loyalty with Facebook pages, show innovation on blogs and address customer concerns on Twitter, social media is threading its way through the marketing and sales, research and development, customer-service departments and more. All of which gives rise to the question: Just whose job is it anyway? Answer: everyone's -- so it's important to get all those disciplines working together. Take Ford Motor Co. for example. The automaker saw $2.7 billion in profit for 2009 -- a huge turnaround from a record loss the prior year -- and it smartly used social media to help disassociate it from the bankruptcies and bailouts of its rivals. But that required breaking with custom at Ford and pooling the resources of marketing and corporate communications. "We've been living this for the past year," said Scott Kelly, Ford's digital-marketing manager. "Historically, we had very little interaction with public affairs, but ever since the congressional bailout for the other two automakers, we needed to combine marketing and public-affairs forces to get the right message out around Ford so we didn't get dragged down by GM and Chrysler." In late 2008, Ford brought together the teams from what was then called public affairs (now corporate communications) and marketing to plan all efforts simultaneously. That means Ford's Global Digital and Multimedia Communications Director Scott Monty is now involved in marketing's launch-planning meetings. "In the past, public affairs were brought in at the end," said Alex Hultgren, Ford's digital-media manager. Now, Mr. Kelly said, "I talk to people in public affairs daily, where it used to be monthly." Ford's social-media efforts include FordStory.com, which went from a political advocacy site when the automaker appeared before Congress in 2008 to a social-media hub today. The automaker also launched the Fiesta Movement last spring, in which Ford lent out 100 cars, along with gas and insurance, to YouTube bloggers for free. The Fiesta videos attracted 3.5 million views and won 38% awareness among 16- to 24-year-olds last fall. As of today, Ford reports that the campaign has computed to 6,000 reserved cars -- months before Fiesta goes on sale this summer. Sometimes it's also about dragging non-marketing types into social-media meetings. "Our client contact has stayed the same, but now new people are in the room, like from R&D or merchandising," said Ketchum's Jonathan Bellinger, VP-social-media strategy. "Whether or not they've been volunteered, we've been asking for those people because it's not necessarily the marketing people that audiences are most interested in." Southwest Airlines, for example, has tapped some flight-crew members to blog for Nuts for Southwest, which aggregates photos and videos. The blog also addresses news stories, such as the one that erupted recently when film director Kevin Smith tweeted that the airline kicked him off a plane because he was too fat. The blog is primarily a brand and PR tool, but customer service is also brought in and given a social-media bullhorn. "If your goal is customer care, you need people inside [the company] that can take action and do something about it," said Sarah Hofstetter, senior VP-emerging media and client strategy for 360i. Best Buy has made this model famous with Twelpforce, its customer service handle on Twitter. The retailer's employees sign up to field customer tweets and respond to service questions or requests for recommendations. Any employee can sign up, but all are subject to company-wide protocol and guidelines. Best Buy did not respond to multiple calls and e-mails for comment. That's not to say marketers can navigate social media without agencies. Digital and PR agencies are vying for ever-increasing social-media budgets. "In 2010, we start to see funded conversations," said 360i's Ms. Hofstetter. "Instead of funding a particular campaign, they are funding an investment in an ongoing conversation with consumers. That's a big shift." And that change isn't expected to slow anytime soon. Forrester Research forecasts social-media budgets will on average grow 34% yearly from 2009 to 2014 -- faster than other kinds of digital advertising. Ford's Mr. Kelly doesn't see social media as something for PR and digital shops to fight over, since both types of agencies bring different skills to the table. "We consider it one budget," he said. "It doesn't matter if it's a marketing or public-affairs budget." Ford has been less susceptible to the tug of war between digital and PR agencies for social media because its agency, Team Detroit, houses multiple shops under one roof. The WPP collective, dedicated entirely to the automaker, houses agencies spanning media, PR and creative. For Ford, creative and digital are responsible for building content for social-media channels (like apps for Facebook), while PR keeps up social page day-to-day management of things like posting events and responding to customers. Ford has also looked to small social-media boutiques like New York-based Undercurrent for programs such as those for Fiesta. Social-only shops are the newest breed in the agency landscape and are proliferating rapidly. In January, Austin-based Powered acquired Joseph Jaffe's agency Crayon for strategy; events agency Drillteam; and Facebook-focused StepChange to create a full-service social-media agency with a national footprint. "We're always going to start with our agency of record," said Ford's Mr. Hultgren. "We may look at a boutique agency to manage a piece of social media. Boutique agencies can be singularly focused on something. But if we want a pure focus on some social-media task, we want a boutique to focus on a pilot. Once we've proven out that model, we'll hand off to Team Detroit to integrate." But while it's clear that social media has helped change perception of Ford, the biggest test is whether it sells cars. "Social media can fall anywhere in the range of the selling cycle," said Mr. Monty. "In our case it's on the broader end: awareness and perception. It's more of a branding tool than a sales tool. But on the local level, where the dealer gets involved, that's where it get can work for lead generation and CRM." The social-media department functions at a senior level, reporting to the CMO or CEO, and is responsible for all social-media activation for the brand. "We work with a lot of clients that have appointed one person," said Ketchum's Jonathan Bellinger, VP-social media strategy. "It's nice to have a celebrity; it puts a human face on a company. You can achieve that by having one person being the public face both externally and internally, but it can get distracting because it becomes about those people." Dangers: Having a social-media head means departments outside that person's scope might not benefit from efforts in the medium. For example, is customer care being considered if social media is centralized under marketing? This model doesn't necessarily take into consideration social media's influence on the entire business. Essential roles: The social-media lead. Marketers with this model: Ford. Scott Monty, global digital and multimedia communications director, joined the automaker from social boutique Crayon and has been a visible proponent of social media for the brand. Mr. Monty operates within the corporate-communications department, which reports directly into Ford's CEO. In this setup, no one person technically owns social media. Instead, all employees from customer care, marketing, media and beyond are represent the brand and work social media into their roles. This is often implemented through training and encouraging social media use across an organization. Dangers: If there's no standardized practice, social media can veer a brand off-message. For example, Jet Blue Senior VP-Marketing Marty St. George brought Twitter into the agency-of-record pitch process -- tweeting the news of the search to see how many agencies were digitally savvy enough to find it there. "That experiment is over -- and not to be repeated!" he tweeted after his tweet blew up into media coverage. Without a leader, learning about new social technology or sites then also falls on individuals. Essential roles: Senior leadership that champions social media; training and internal communications around social-media policy is necessary. Marketers with this model: Best Buy is decentralized because everyone in the organization has a role in social media, as Twelpforce demonstrates. Any employee can sign up to respond to customer queries on Twitter. The retailer does, however, have protocol and guidelines in place for tweets, and it has social-media experts in marketing. Last summer, CMO Barry Judge crowd-sourced a job description for a senior manager-emerging media marketing. Brands like IBM, Intel and Kodak have published social-media policies. This involves centralized best practices and decentralized execution. A brand maintains a committee of social-media stakeholders to work up its position and voice, which it disseminates to the company at large. From there, each discipline is left to incorporate social media into its individual executions. Dangers: How do you hold departments accountable to a research council? Also, when a social-media program goes sour, who ends up as the fall guy, those who built the social-media strategy, or those who implemented it? Essential roles: A team of social-media experts plucked from various departments. Marketers with this model: Ketchum's Mr. Bellinger cites his client Kodak as a company that's found a good balance. It employs Jenny Cisney, chief blogger, in marketing, but she's tasked with steering the company's social-media presence rather than own it entirely. Kodak has published online its social-media policy for employees within a guidebook for marketers looking for lessons in social media. Starting in 2005, IBM used a wiki to crowd-source guidelines for a company blog and has asked employees to collective revise the rules for new forms of social media. Those efforts ultimately feed back to IBM's social-media head Adam Christensen, who most recently spearheaded the company's Smarter Planet blog. 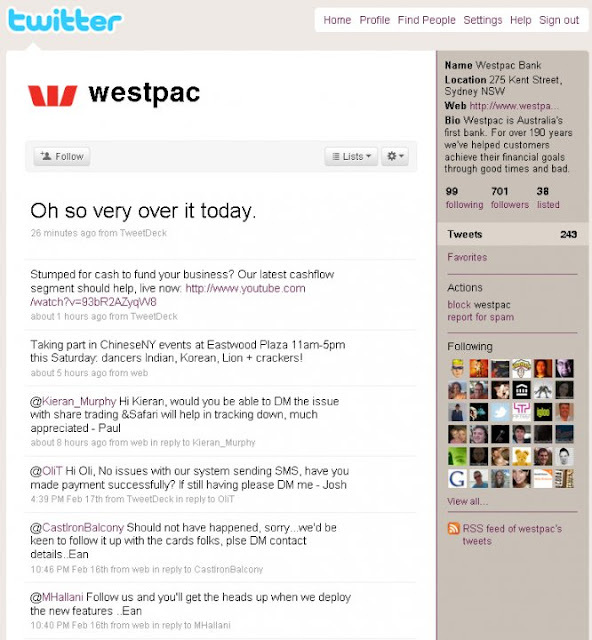 WANTED: Social media expert for major Australian bank. Urgent start required. John Herrman, gizmodo.com, Feb 2010. Before Windows Phone 7 was even an embryo of a concept, Windows Mobile was king: It powered nearly half of smartphones in use, a led the industry in features. Then, in 2007, things started to go wrong. Very, very wrong. 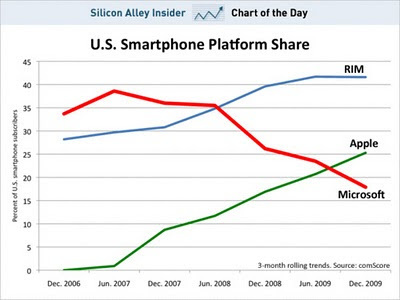 Silicon Alley Insider has charted Windows Mobile's platform share, which is to say the proportion of users who were using it at a given time, over the last four years. For showing decline, figures like these are more telling than sales—they mean that, for years now, people haven't been buying Windows Mobile phones nearly as fast as they've been ditching them. More interesting than what it shows is what it projects: Windows Mobile 6.x phones have been collectively kneecapped by Microsoft's announcement yesterday, and rendered spectacularly unbuyable outside of enterprise circles. In other words, that line—the one that dragged down past RIM in 2008, and that dropped past Apple last year—is going to keep plunging for the rest of this year, until Windows Phone 7 tries to haul it back up. And until then, it's only going to get steeper. Google has unveiled one of the greatest toys ever – a virtual glass elevator that lets you fly around the world. Made by a few of the engineers in their spare time, the Liquid Galaxy project is an interactive booth with wraparound LCD screens. The screens show synchronised views from Google Earth and you can use a six-axis mouse to move your way through air and water. The video was taken by Mashable staff at a live demo by creator Jason Holt at TED. Mr Holt, a software engineer at Google, first announced the project last year. “It was amazing to all of us how much more impressive Google Earth felt when we were surrounded by screens and able to turn our heads to look around (and even walk around),” he said. Liquid Galaxy is the product of Google’s “20 per cent time” initiative which sees its engineers encouraged to pursue their own projects on company time. How Much Are Domain Names For Campaigns Worth? Marketing and advertising agencies looking to strengthen campaigns might pay just about any price for a solid domain name if it means building a better relationship with consumers. Companies can build the greatest campaign in the world, but if no one identifies the Web site domain name with the brand, even the most expensive names become useless. Direct navigation, where people open a browser, type in a name and expect to find the correct Web site and content, remains the No. 1 Web navigation technique. That's why when typing in Vodka.com into a Web browser consumers can expect to find drink recipes and information on vodka makers. Vodka.com sold for $3 million, but not all domain names sell for that much. In fact, the average name sells for several thousand, according to Jeremiah Johnston, chief operating officer at Sedo, a trading platform for online domain names and Web sites. "The company bought the site to start to build a relationship with consumers in America," he says. "The only way you can do that if the customer comes back to your Web site by building on the TV or radio campaign." Johnston says people use domain names like search terms. Rather than entering them in a search box, they enter the name in the browser. So, when a company runs a campaign, they should make sure the domain name matches search terms that marketers would expect consumers to enter into a search query box on an engine, such as Google, Microsoft Bing, or Yahoo. The short, concise terms also position the company as the expert in the field. For example, Calvin Klein owns Bras.com. Domain names matching search terms that define the business can generate between 10,000 and 30,000 unique visitors monthly, according to Johnston. He makes the case by suggesting that Sedo research demonstrates that these domains can lead consumers to the site much more easily then if they had to find the information through a search engine. "With search engines you have to invest a lot of money in search engine marketing, both SEO and paid clicks," he says. Brand owners need to acquire domain names early in the campaign- and product-development cycle, but they run the risk of letting the cat out of the bag. Johnston explains that this is one reason Apple didn't acquire iPad.com before making the announcement. Sedo's brokerage department, which handles the bigger-ticket sales, keeps these deals confidential to allow companies to swoop in and buy the names. It's no surprise .coms are the most demanded domain extension, accounting for 44% of all domain sales on the Sedo marketplace in 2009. The number of fixed-price domain names changing hands grew 4% last year compared with the prior year. Top-selling domain categories for 2009 included software, employment, services, regions, country and cities, tobacco, insurance, three-character domains, hardware and casinos. The average price of a .com site dropped approximately $719 in the fourth quarter of 2009, sequentially. The "seven-figure sales" weren't as prevalent during the year, but more domain names were sold, Johnston says. The dot-biz extension, however, saw the biggest jump in the average sale price. 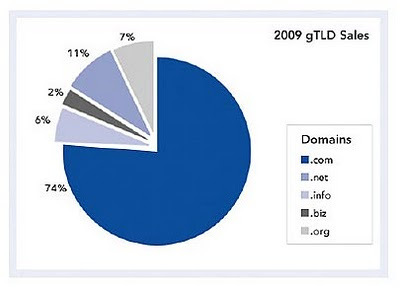 Sedo attributes this to growth in sales of one character dot-biz domains, which first became available through the dot-biz registrar in September 2009. Look out, Madison Avenue -- venture capital investors are happily underwriting your extinction. Ian Sigalow, a principal at Greycroft Partners, said "agency replacement software" is one of the key investment areas the firm is focused on this year. "Companies have agencies for public relations, buying media and planning marketing campaigns," noted Sigalow, speaking at a venture capital panel on digital content at the OnMedia NYC conference Tuesday. "We're looking at companies that let them do these agency services in-house." Greycroft invests in a range of companies in the digital media and advertising space including social media ad company Buddy Media, online survey service United Sample, social app analytics provider Sometrics, and content distribution service ImageSpan. Huffington Post is also among its portfolio companies. Sigalow maintained that not only corporations, but smaller companies will increasingly take on traditional agency functions with "lighter weight tools" made by these startups and others. To the extent that agencies can acquire these companies, of course, they can try to stave off disintermediation while providing venture capital firms an exit strategy for their investments. But VCs gathered on the panel expressed little optimism about the M&A market as a way for startups to cash in. After getting burned by acquisitions that ended in failure in recent years, big media companies especially are reluctant to spend on snapping up digital upstarts. "Anything over $100 million they're just not going to touch," said Warren Lee, a venture partner at Canaan Partners. "For startups, they can't assume they're going to get acquired in the next couple of years." Last month, PricewaterhouseCoopers reported that overall venture capital investment in 2009 dropped to $17.7 billion, its lowest level in more than a decade. Funding of Internet-focused companies dropped nearly 40% -- to $2.9 billion in 629 deals from $4.8 billion in 902 deals in 2008. The outlook for 2010 doesn't look much brighter. While other panelists weren't as specific as Sigalow about their investment focus, they collectively expressed interest in businesses that can take online user data and slice and dice it for marketers and publishers. "The big challenge is 'how do you take the massive fragmentation and massive data sets and all the ways people are interacting online and pull that together for advertisers?'" said Amish Jani, managing director at FirstMark Capital. And Glam Media -- which Tuesday announced securing $50 million in a mezzanine financing led by Aeris Capital and prior investors, including Burda Digital Holding and Mizuno Capital -- has raised a total of $130 million to date by aggregating a network of more than 500 lifestyle sites and blogs to quickly become one of the Web's most trafficked properties. Companies that can apply sophisticated targeting and tracking technology to social networks and other user-generated forums to help unlock ad spending stand to gain. "There is a huge amount of content but the understanding of how content performs and how users interact with it is still rudimentary," said Lee, whose firm has invested in Internet companies including Associated Content, AllBusiness, Match.com and Peer39. Venrock's David Pakman said one model his firm isn't buying into is the build-it-and-they-will-come plan. "We're not investing in the humongo audience, no business model -- but don't worry, we'll figure it out," he said. Seems to be working pretty well for Facebook. Brands Are Now On "Digital Time"
Brands that grasp today's "double-click mentality" click with consumers. While the reviewers pick apart Apple's iPad, one unassailable argument remains: We are not just living in digital times, but on digital time. From getting news to reading the latest best-selling novel, to watching reruns of Gilligan's Island, most of the content, products, information and entertainment we enjoy is available with a click. Consumers are conditioned to get what they want when they want it. I'm not sure this "double-click mentality" is necessarily a healthy thing, but it's real, and the reality has huge implications for marketing and media executives. People want things that are immediate and convenient. Woe to marketers--even bricks-and-mortar retailers--that don't get this. Double-click gratification is a table stake. This is not just true of the most manifestly popular areas of digital life--the entertainment, product review or breaking headline sites--but of digital life at its most practical. In fact, it's when dealing with life's most mundane endeavors that double-click differentiation can separate one brand from another. This point was brought to life for me on a recent visit to Florida when I entered a CVS and watched a couple of savvy seniors swipe their CVS loyalty cards in front of the coupon kiosk inside the entrance to the store. The drug store chain, as these folks experienced through its digital coupon dispensers, provides instant savings offers and in-store specials based on each customer's purchase history. Couponing, once considered a time-consuming effort practiced by fiscally astute homemakers, is no longer about scissors and little slips of paper. It's about highly developed digital technology and behavior. Given both the dismal economy and the digital tools now available, coupons and all manner of promotion have become critical initiatives in the quest for brand dominance and customer loyalty. CVS is just one of many retailers that recognize that e-couponing, as it's known, is a branding tactic that helps distinguish its brand from others in the field. Another, Kroger, has invested in technology that helps consumers load coupons onto their cellphones. Shoppers then flash them during the checkout process for on-the-spot savings. Safeway, with more than 1,500 stores nationwide, also offers its customers the convenience of acquiring coupons through their computers or cellphones and automatically applying discounts at checkout. And Stop & Shop has gone so far as to arm its shopping carts with mini-computers that tally up purchases as customers shop and offer saving options from aisle to aisle. This new technology not only makes special deals more accessible, it makes them more personally relevant, another criterion in smart brand building. As consumers download coupons and use QR codes to access exclusive promotional content from marketers, companies can collect data about their buying habits, making it possible to offer discounts on things that people want and need, not just what the company wants to sell that week. It's no surprise that the biggest package-goods brands, including Procter & Gamble, General Mills, Clorox and Kimberly-Clark have jumped on the fact that e-coupon redemption rates are higher and easier to track than paper coupons and have made it a branding priority to link up with both retailers and independent digital technology innovators, including Cellfire and Shortcuts.com, to ensure their brand names are front and center. That the old ways of promotional initiatives must change has not gone unnoticed by Target. An early adopter of Facebook and Twitter, Target also understands that "double-click mentality" isn't just the digital means of providing consumers with instant and easy gratification. For example, I recently received a booklet of "Flip. Clip. Save." coupons from Target in the mail which, unlike traditional coupons of yore, were for specific categories of products, not specific brands. Rather than needing to remember if my deodorant, potato chip or soda coupon was for one brand or another, Target took away the obstacles and made it possible for me to buy the brand of my liking at a discount. At a time when newspaper readership is sadly declining, and Internet usage is up, paying heed to the tenets of a double-click mentality is essential. Consumers have little, if any, tolerance for waiting and for complexity. They know they can get information when and how they want it. No matter what the activity, if people can't literally or figuratively double click and get what they need, forget it. It's a critical point of branding differentiation. Marketers need to operate with a double-click mentality or their consumers will click with brands that do. Allen Adamson is the managing director of the New York office of Landor Associates, a brand consultancy and design firm. He is also the author of BrandDigital and BrandSimple.